Move your mouse cursor over the pictures to see calculator model names. Click to view larger images. Set an aircraft down safely. To avoid a crash, evaluate flight data and inject carefully considered amounts of fuel into the retrorocket. Resolve the quadratic equation ax²+bx+c=0. Type in values of the parameters a, b and c, and get the existing real roots. Linear regression is a statistical tool that helps you to determine the "best-fitting" straight line for any given set of experimental data. In the relationship y = ax + b the constants a and b are being determined. Given appropriate geographical coordinates, the distance from the fountain in your backyard to the dog-kennel of a friend living round the corner or in the Caribbean is calculated with high accuracy. The distance is measured across the WGS-84 ellipsoid. Both bearings are presented too. A viscoelastic material like an amorphous polymer is stretched to a given value of the strain. How does the stress, necessary to maintain the constant strain, changes as a function of time? Grounded on the Burgers model, the question is numerically and graphically answered. Quite some years ago already, the programs have been tested using version 1.12 of the TI-83 Plus software. Running them on the TI-83 calculator instead of the 'Plus' should much more likely be a gratifying business than a rather boring confrontation with an eruption of error messages, at least on the assumption that the handed syntax will have been put correctly into the calculator. Yet, if you do encounter any difficulties on this, please let me know the faced problems and your possible findings about solving them. After updating the TI software (version 1.15) I faced one minor problem (March 2003). The TI-84 Plus SE obeys full compatibility. Your browser doesn't support scripts. TI-83, TI-83 Plus, TI-84 Plus, TI-84 Plus Silver Edition, TI-Nspire, TI-Nspire CAS. 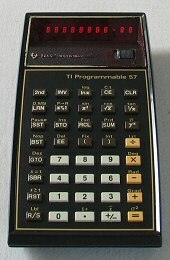 The "TI Programmable 57" appeared in the late seventies; it offered no fewer than fifty programming steps! Unfortunately the supplied nickel cadmium battery-pack wasn't granted to live long, so I made my TI-57 running on a built-in common rechargeable unit. 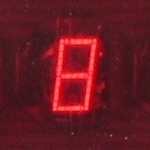 Close-up: each digit in the LED display is magnified by a small lens in front of it. No worries about flat going batteries. After twenty years odd this slim calculator is still in daily use!